Tired of waiting for Richard Branson’s Virgin Galactic Spacecraft to let you buy suborbital flights tickets to space? UK theme park Alton Towers has the next best thing with the world’s first virtual-reality dedicated roller coaster, the “Galactica”, that will give riders the illusion of being launched into space. Galactica will take riders through the Great Orion Nebula, the lava lakes of a planet they call Nero 5, the frozen landscapes of another planet named Kepler 9, the edges of our solar system, and even through the birth of a star. These planet based simulations kind of remind the unFOMO team of the exploration missions from the first Mass Effect, which is pretty pretty awesome! Set to open April 2016, the world’s first virtual-reality dedicated roller coaster may look like a standard strapped in roller coaster but riders are given a VR headset that will give them a fully immerse space mission look and feel! Think the Imax Experience, except you’re on a giant mechanical monster that inverts you two times, has speeds of nearly 50mphs, and is able to pull G-forces of 3.5 on you (more than astronauts feel on rocket launch). 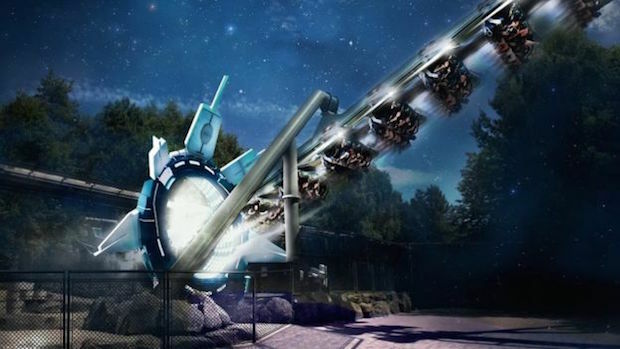 The ride was developed by Bolliger and Mabillard, a roller coaster design company, back in 2002 under the name “Air” but Alton Towers is revamping it with the new virtual-reality technology and renaming the ride “Galactica”. The headsets used for the ride look a lot like the Oculus Rift handsets which is what the simulation developer, Figment Productions, seems to like working with.